This movie is often singled out for criticism for being too outlandish, as though the idea of 007 going into space is just too much to believe even by Bond film standards. In fact, it's more of a small step than a giant leap for the Bond franchise, which had been heading in this direction with a degree of inevitability for years. The very first Bond movie, Dr. No, tied in with the American space programme. In You Only Live Twice, 007 donned a spacesuit, although he didn't actually make it as far as the command module. Then Diamonds Are Forever featured the launch of a deadly satellite. GoldenEye and Die Another Day would subsequently involve similar orbital weapons. 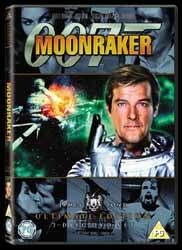 Certainly there are good reasons for disliking Moonraker, but its outer-space setting is not one of them. Visual effects supervisor Derek Meddings pulls out all the stops to create illusions that stood up well against the Star Wars and Star Trek movies of the time and still stand up to the best computer-generated imagery of today. As the "making of" documentary reveals, Meddings devised some elegantly simple solutions for achieving convincing effects, such as pouring salt from a model shuttle to simulate the craft's vapour trail. He also took more painstaking measures to superimpose models over space backgrounds without resorting to the more expensive matte techniques (though to be honest, the strategic absence of stars is noticeable in places). What is perhaps most incredible about this film is that the director (Lewis Gilbert) and co-writer (Christopher Wood) of such a finely honed and sophisticated movie as The Spy Who Loved Me could have created a follow-up that is so uneven in style and tone. Elements that worked in moderation in the previous movie are blown out of all proportion here. For instance, in Spy Richard Kiel's Jaws cut a terrifying figure who also exhibited brief flashes of comic potential. However, in Moonraker he becomes a constant figure of fun who, in between falling onto a circus tent, crashing into a cable-car control room, plummeting over the edge of a waterfall and falling unconvincingly in love - each time pulling a funny face - provides all-too-brief moments of threat. And while a boozing tourist's double take at Bond's latest amazing vehicle is funny, a pigeon's double take is not. Also, couldn't Wood have thought up a new motive for his villain this time around? Whereas Stromberg wanted to destroy the supposedly decadent human race and create a brave new world in the hostile environment of the sea, Drax (Michael Lonsdale) has the radically different idea of destroying humankind and creating a brave new world in the hostile environment of space. The film does offer some magic moments and more than its fair share of classic lines, including most of Lonsdale's deliciously deadpan delivery as Drax. Take, for example, "Look after Mr Bond. See that some harm comes to him." Or: "Mr Bond, you defy all my attempts to plan an amusing death for you." Not forgetting: "James Bond. You appear with the tedious inevitability of an unloved season." And the space-bound final half-hour is simply stunning. Drax and the name of his shuttle fleet are the only story elements that are retained from Ian Fleming's original novel. As with The Spy Who Loved Me, Wood novelised his screenplay most effectively, offsetting the plot's more outlandish elements with moments of realism such as 007's terror at making the journey into space. Unfortunately, owing to the aforementioned Fleming elements, which (presumably under pressure from his publishers) Wood retained in his novelisation, the book cannot truly inhabit the same literary canon as Fleming's. However, all you need to do is imagine a simple change of name for the villain and his shuttles (Starseeker perhaps) and that problem is solved. Aside from the usual pair of documentaries, disc 2 also includes 007 in Rio, an original 1979 production featurette; another of Ken Adam's Production Films; test footage for the skydiving sequence; and storyboards for that sequence as well as for the cable-car battle. The first audio commentary, featuring Gilbert, Wood and executive producer Michael G Wilson, isn't particularly in-depth or incisive. Their observations tend to be along the lines of, "Oh, that was good, wasn't it?" "What was?" "Oh, we've missed it now," and, "Roger looks good in this one." That last comment comes despite Roger Moore's age beginning to show, as his liver spots are exposed to the merciless clarity of DVD. The new second commentary, provided by the man himself, the very witty Sir Roger, makes for rather better listening. Moonraker isn't exactly out of this world, but it's still worth making space for.